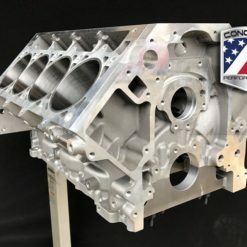 The LSR aluminum engine block is cast of a proprietary 356 T6 Aluminum Ingot, featuring Spun Ductile Iron Sleeves. The standard deck 9.240″ and the tall deck 9.720″, with or without raised cam, will be available with our exclusive Double Cross Bolted Main Cap Feature. Reinforced from top to bottom. Features like added cross bracing in the lifter valley, maximized crankshaft saddle radius and a 40% larger footprint from our double crossbolted main caps means the LSR is built for maximum performance. Concept Performance prides itself in providing quality products that are 100% cast, machined, and assembled in the United States of America. More specifically, right here in the U.S Midwest.